Search and be an INSPIRE! Keep Learning & don't give up! We are the explorers! Passing through the futuristic mechanic ride to the ancient egypt and pre historic park of dinosaurs then get wet at waterworld. Now we’re at the Far Far Away Kingdom. We can see a beautiful big castle and garden. This area is for Shrek animation. 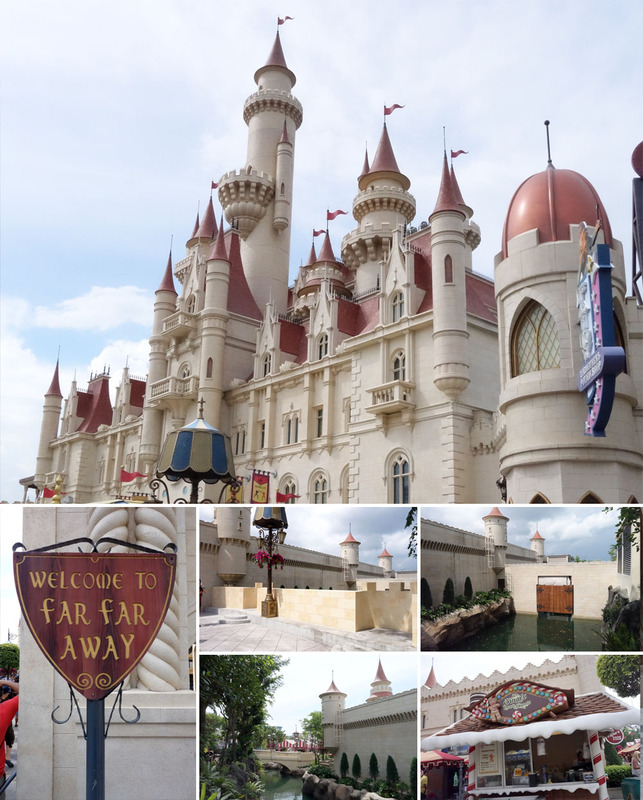 There’s a ride for this area but Jesse said it’s not really good.. it’s just like you sit on the boat and looking at the moving dolls/puppets (remind me of Istana Boneka at Dunia Fantasi, Jakarta). We don’t want to waste our time, meanwhile this area is beautiful and we took some picture and suddenly..
PUSS IN THE BOOTS cosplay appeared, brought by the staff… Puss is a cat, one of the main character of Shrek animation, he also has its own movie. He’s so cuteee… all the people so excited to take picture with him.. we queued. The Puss cosplay really know how to pose and so into the character.. total! Pose with his signature pose and taught people how to pose so they will have the best pose and photoshoot.. he is great. It’s our TURN. I love him so much.. I love cat.. I love puss.. I hugged him tight.. meow so happy.. wanna bring him home. That can be one of the best moment here.. we continue to walk and we arrive at Madagascar area.. jungle feel and there have cafe and ride. But we just keep walking and found the quartet statue.. they are Alex the Lion, Marty the Zebra, Melman the Giraffe and Gloria the Hippo. They’re hugging each other, showing how much they love each other, love and friendship. 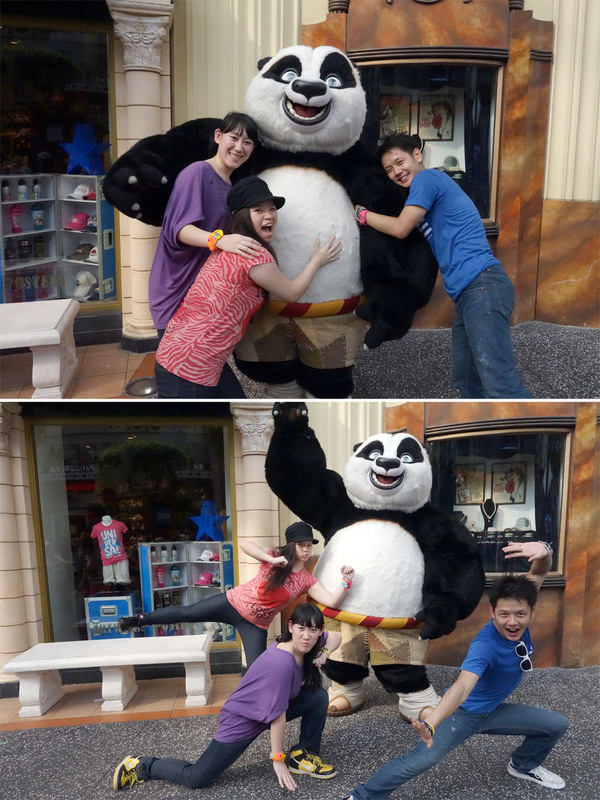 And of course we have to take pictures.. and we did the same pose like they do. The girls hugged me tight. Well we’re also full of love and friendship. 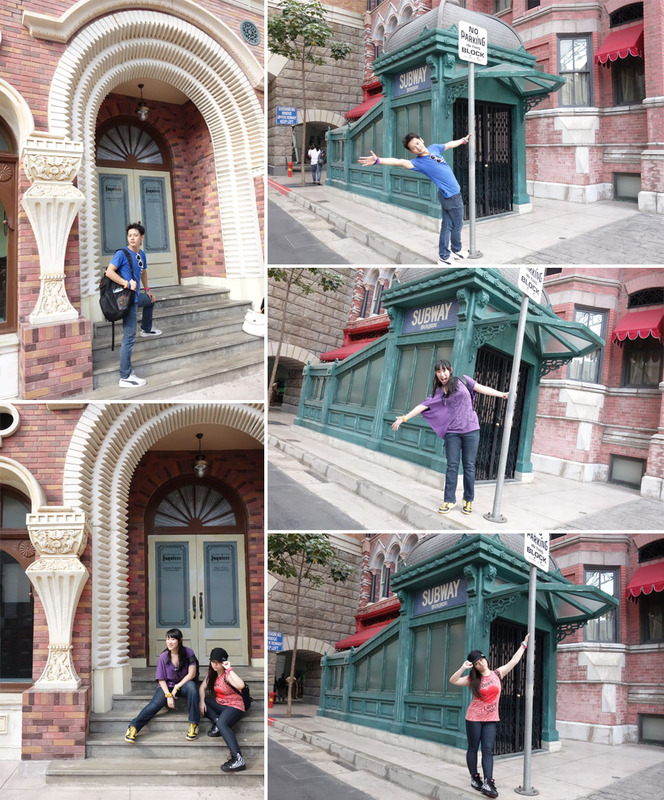 Hehe..
Back to the main street and still looking for some corners to take pictures before leaving USS. Found a building that look like Elite college (But it’s a Library) that made we pose like college students hanging out. I love the photos, makes me feel young again. Miss the college life. 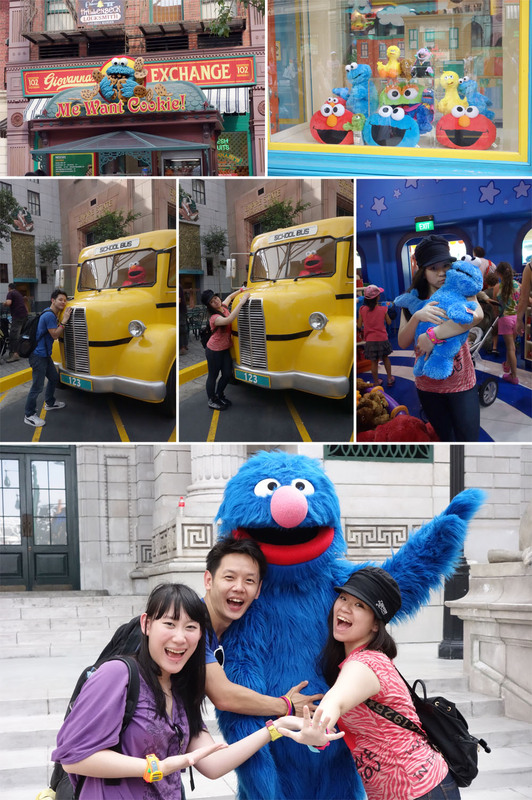 We also found Sesame street character, Elmo school bus and also Sesame street souvenir shop. Not really fan of them, but Cookie Monsters somehow looking cute. 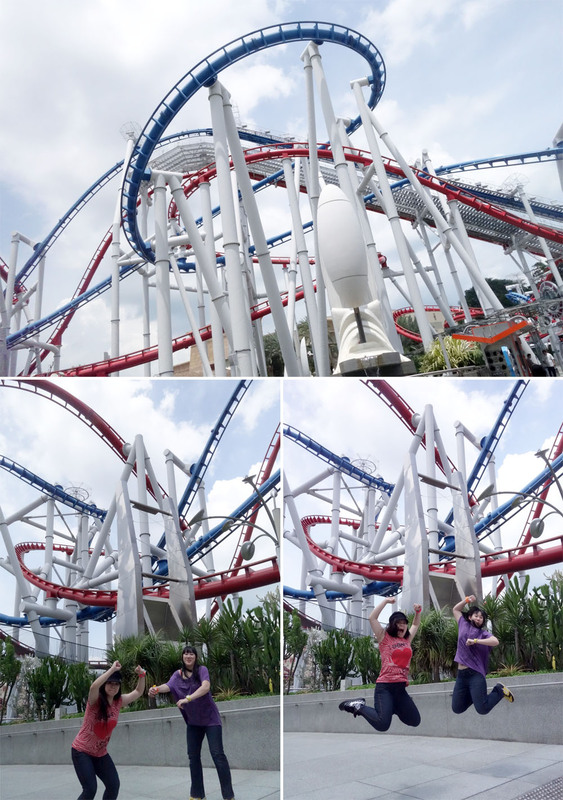 Now I feel kinda completed exploring the Universal Studio Singapore. I hope I can come here again someday. Hopefully soon haha. 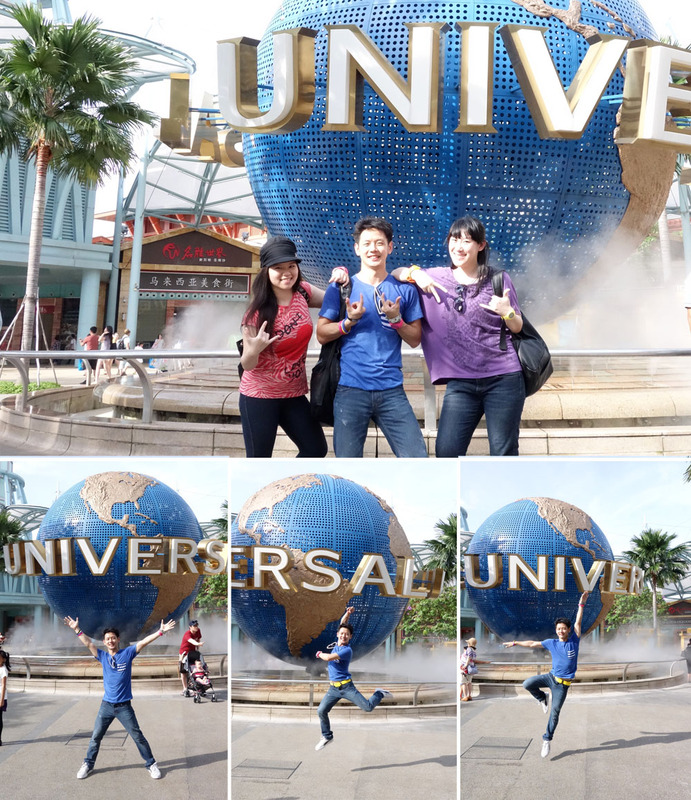 To wrap it up.. we went to the iconic Universal Studio Spinning Globe. So hard to take best picture here, because so many people walked by and also find the right timing waiting the Universal Studio logo to appear completely. We posed, we smiled, SNAP! and JUMP! This is it! 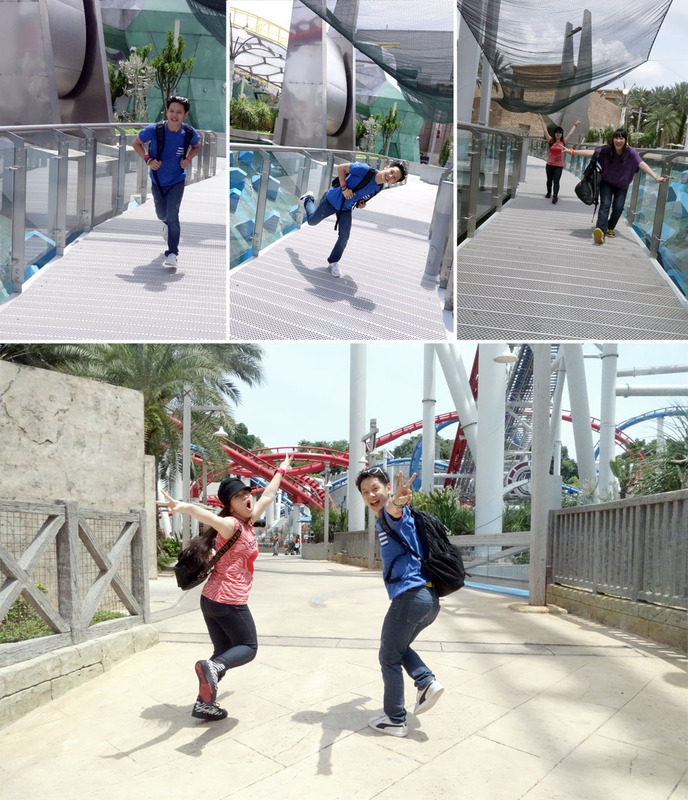 Wonderful day in Universal Studio Singapore. Next is SEA Aquarium.. ready to swim?